Porsche have celebrated their record 17th win at the 24 Hours of Le Mans, led by their groundbreaking 919 Hybrid. Le Mans 2015 saw the German giant finish the grueling race with a convincing lead, with Porsche cars in both first and second positions. This 17th win cements Porsche as record-holders for this punishing race, making abundantly good on last year’s promise, and they produced a spot to mark the occasion. 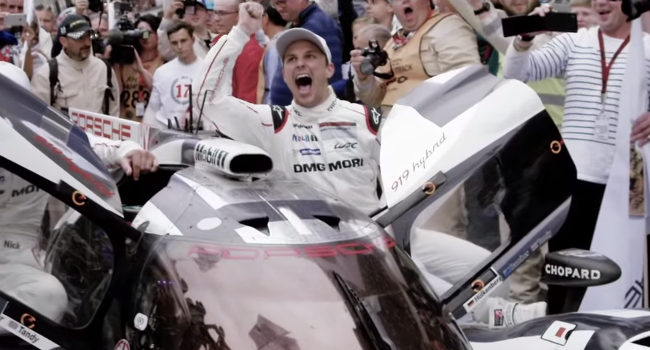 It begins with a look back through Porsche’s 60-year history at the race and swells with pride as it coasts into this year’s montage, building to a cinematic sweep of emotion as we see how the race was won. We helped find the fitting victor’s mantle in terms of music: the aptly-titled ‘Finale’ by Sean Redmond provided the orchestral poignancy and sense of high-stakes payoff in abundance. Our congratulations to Porsche on their record victory!